In any case, Water St. was and still kinda is, at least occasionally over lunch. So without further ado, the lloyd-tones present for your enjoyment the one-and-only, never released, 700 Water St. album, Dead End. Recorded (spring '96) and Mixed (fall '98) at AudioArts Studio, where Jeff Moeller worked the boards like a king. Thanks to all our friends and families for their support and encouragement over the years. Special acknowledgment is due to the assorted alumni of 700 Water St.: J. Mark "Slushy" Russell, David "Cornelius" Stone, Barton "Krusty" Davis, Mason "Sleepy" Jones, John "Xonk" Dawson, Kevin "Otis" Photiades, and Wayne "Horrible" Korbl. The Austin Outhouse is dead, Long live the Austin Outhouse. 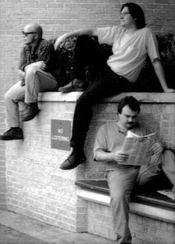 Drivin' To Tulsa was co-written by David Harp, Brian Farry, Jon Melançon, and Steev.